The unique blend of prime pork & ham - min 90% meat. Fully cooked ready to eat hot or cold! Gluten free. 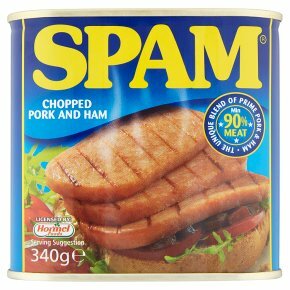 Just add... Spam® Brand Cheese 'n' Spam? Toastie Proper Spam? User Guide 1. Lift & pull, wiggle 2. Squeeze until it pops! 3. Tap & squeeze 4. Slice & fry! Or grill, bake, microwave or eat cold!